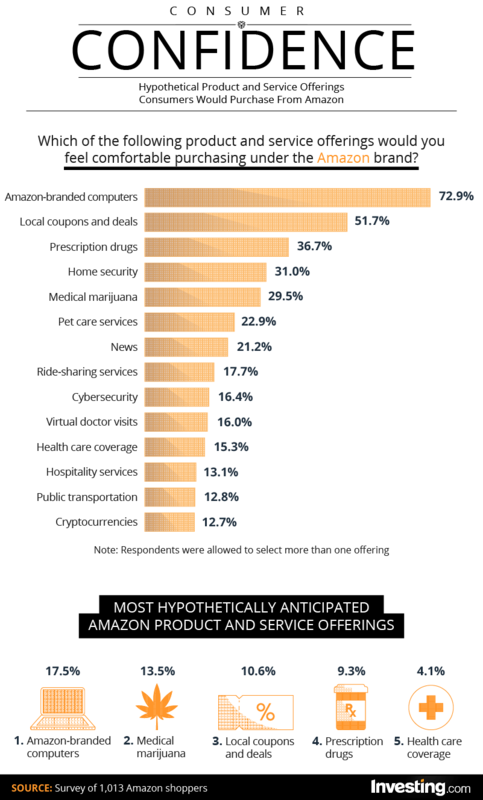 Newswire > Report: 12.7% of Shoppers Want Amazon to Sell Crypto Services, is it a Possibility? Only 12.7% of Amazon customers want the marketplace to sell crypto products or services, according to a new report. Global financial portal Investing.com surveyed more than 1,000 Amazon clients to study their consumption rate from the online portal. The survey included a section that discussed possible products – hypothetical services that Amazon should offer as a part of its industrial expansion. Respondents, who were allowed to select multiple options, voted mostly in favor of an Amazon-backed computer offering (72.9%), followed by local coupons and deals (51.7%), prescription drugs (36.7%), home security (31%) and even medical marijuana (29.5). The Investing.com survey followed years of speculation that Amazon would integrate cryptocurrencies like Bitcoin on its platform. Enthusiasts expect the e-commerce behemoth, which serves 310 million customers worldwide, to drive a massive crypto adoption in the future. However, the US-based company had not shared any fancy plans that hint a potential crypto-integration on its platform. At the same time, Amazon has flirted with the idea. In November 2017, media reports indicated that the company had acquired digital currency-related domain names. The hype later died as the crypto market as a whole headed into the financial years, losing one-third of its value by the end of 2018. In the same bearish year, Amazon won a patent for a data streaming platform that would allow people to view cryptocurrency transactions in real-time. The application mentioned Bitcoin, saying that retailers could combine a user’s bitcoin wallet address with his/her home address to create a merged data record. In August 2018, an anonymous software engineer took Reddit to spread a rumor that Amazon was interested in accepting Bitcoin as a payment method. The post, now removed, also stated that the company was feeling cold-feet because of the digital currency’s underlying price volatility. The lower vote in favor of crypto adoption somewhat attributes to less awareness about cryptocurrencies among the general public. It is not clear whether or not the participants in Investing.com survey had prior knowledge about cryptocurrencies. But given a hypothesis that they didn’t, it was improbable of them to tick cryptocurrency over/alongside other available option. Overall, everything is just words unless Amazon validates its entry into the cryptocurrency space. A 12.7% positive response is not ideal, but the company is likely to conduct its own survey to understand whether or not it would integrate crypto – or even launch its native stablecoin in the long run. The post Report: 12.7% of Shoppers Want Amazon to Sell Crypto Services, is it a Possibility? appeared first on NewsBTC.